An enormous ice slab has been found on Mars by researchers lead by Ali Bramson, a planetary scientist at the University of Arizona in Tucson. 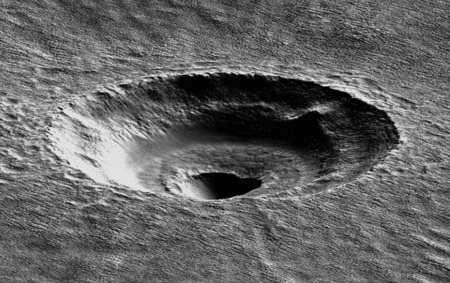 To look at ice hidden beneath the Martian surface, Bramson and her colleagues focused on strange craters in a region called Arcadia Planitia. This area lies in the mid-latitudes of Mars, analogous to Earthly latitudes falling between the U.S.-Canadian border and Kansas. These odd craters are about 1,075 to 1,410 feet (328 to 430 meters) wide. Unlike most craters of their size, which are bowl-shaped, the craters the scientists focused on had terraces on their walls. Such terraces can form when layers of different materials, such as dirt, ice or rock, lie beneath a planet's surface. The researchers used data from the High Resolution Imaging Science Experiment (HiRISE) camera aboard NASA's Mars Reconnaissance Orbiter to create 3D models of the area's craters, which allowed them to measure the depth of the terraces. They next used the orbiter's Shallow Radar, or SHARAD, instrument to beam radar pulses at Mars, which helped them determine the composition of the layers making up the terraces. "It extends down to latitudes of 38 degrees. This would be like someone in Kansas digging in their backyard and finding ice as thick as a 13-story building that covers an area the size of Texas and California combined," Bramson said. One shy little fellow with bloodshot eyes of old-time drillman stood up. "I'm an ice miner," he said. "Learned by trade doing time for Warden like most of you. I've been on my own thirty years and done okay... I should say did do okay... because today you have to listen farther out or deeper down to find ice. "That's okay, still ice in The Rock and a miner expects to sound for it..."
Via Space.com; thanks to Winchell Chung @nyrath from Project Rho for the tip on this story.